Utah is a health conscious state. For many years Utah has been recognized as one of the healthiest states in the nation. These rankings account, in part, for the behaviors of our residents, their communities and environment, our policies as a state, the clinical care provided by our clinicians, and the outcomes of our efforts (cancer deaths, cardiovascular-related deaths, premature deaths, etc.). Overall, Utah is a high performing state and it’s clear that we take pride in our health. The health of our residents drives the health of our state, and therefore we must always consider it a priority. We must always look to the future to ensure that we have an efficient, effective, and affordable healthcare system in Utah. An effective healthcare system must provide thorough, affordable coverage to as many people as possible in an economically sustainable way. Historically, our issues have surrounded access to healthcare for lower-income persons. This has been an issue for many states throughout the nation, and the passage of the Affordable Care Act in 2009 exacerbated this issue by focusing more on who should be paying rather than how to actually control healthcare costs. This well-intended but nearsighted solution is just another example of big government attempting to produce a one-size-fits-all solution to a complex problem rooted in the free market. With the passage of Proposition 3 in the 2018 Midterm Election, the residents of Utah voted to embrace full Medicaid Expansion under the Affordable Care Act. The proposition implemented a sales tax increase to attempt to cover the costs of the expansion. Based on data from other states who have embraced the ACA, Governor Herbert is concerned that the sales tax increase will not be sufficient to cover the costs of the expansion. That is why he has long championed a Utah based approach to Medicaid expansion that helps fill a large hole in our social safety net while providing appropriate fiscal safeguards. The governor supports modest modifications of the law to ensure the long-term feasibility of providing these important services. Q: Why bother with voter initiatives if the government is going to replace what the voters wanted? Government should come from the people. We voted, it passed, make it work. A: Voter initiatives are a vital part of Utah’s lawmaking process. They provide a way to address important issues that lawmakers may have been slow to recognize. Unlike regular legislation, however, that works through a process of public hearings, debate, and mark-ups, the initiative process only gives the voter an up or down vote on a potentially complex piece of legislation. Because there are some real fiscal challenges associated with implementing Proposition 3 as originally written, improvements were in order. In its final form, S.B. 96 provides the coverage sought for by Proposition 3 in a sustainable, cost effective way. It implements the will of the people to care for the poor with quality health care with the added benefit that it can be sustained over the long term with no reduction in other important social services. Q: What do you mean when you say we can’t afford this? Everyone knows we can afford it — we had a $1 billion surplus just this year! A: Actually, Medicaid Expansion through Proposition 3 presents real problems when it comes to sustainability and affordability for the state, and by Fiscal Year 2025, it is expected to be $83 million in the hole for that year alone, and that’s assuming enrollment stays within projections. In most states, enrollment far outstrips projections. To have a successful Medicaid program, we need to plan for a surplus, not a deficit in order to stay in the black. By the way, this year’s surplus came largely from larger than expected collections in income tax revenue. The funding for Medicaid under Proposition 3 is that it is built on sales taxes, which represents a declining tax base. Moreover, roughly half of the surplus was what is called “one time money” that cannot be counted on in future years. Q: Could you share some research and the hard numbers? I keep hearing claims about the budget impact from Proposition 3 but have yet to see the evidence. 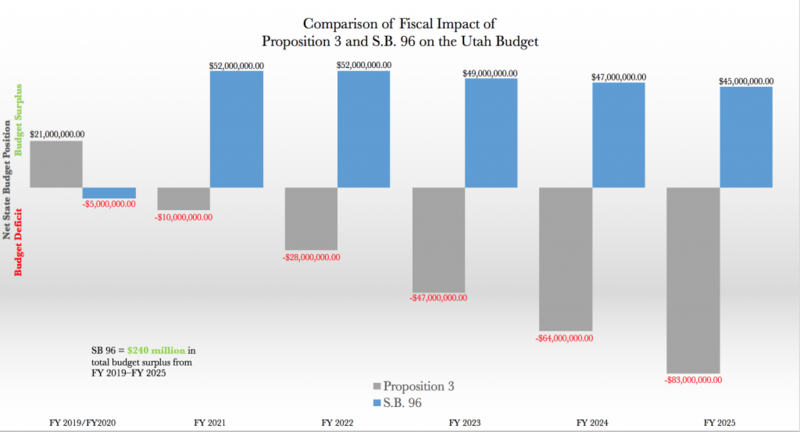 Consensus numbers from the Governor’s Office of Management and Budget and the Legislative Fiscal Analyst showing the fiscal impact of Proposition 3 show that the program would be $47,000,000 behind in funding in FY2023, and running an $83,000,000 deficit in FY 2025. Conversely, consensus analysis of SB 96 shows the state creating budget surpluses in the long term, allowing the state to appropriately prepare for higher-than-estimated per capita costs and higher-than-estimated enrollment. 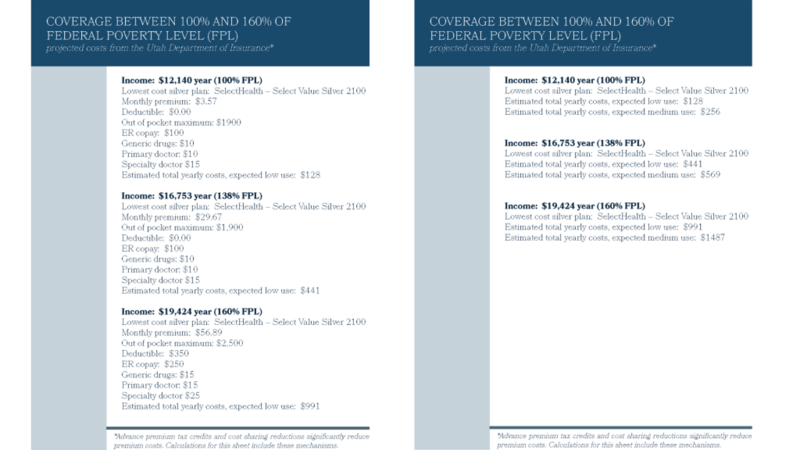 Q: So why not expand Medicaid to those between 100 and 138 percent of the Federal Poverty Level? A: Because, these individuals already have access to quality, subsidized health care coverage on the federal exchanges at little cost to them, and at no cost to the state of Utah. Because the federal government would continue to cover the full costs for this population, Utah can protect its general fund to support other important social services. Across the country the per-person cost of expanding Medicaid has exceeded projections by 76 percent, enrollment has nearly doubled original estimates, and predictions about the total cost missed the mark by 157 percent. We want to minimize the state’s exposure to these costs while maintaining quality care for this population, and encouraging their participation in the federal health care exchange accomplishes this. Q: Why the rush to push this through the session so quickly? A: It may seem rushed from the outside, but in fact, we have been working through these precise issues intensively each legislative session since 2015. The parameters of the issue have not changed, and many legislators and members of my administration have dedicated significant time and resources to educating themselves on the ins and outs of healthcare coverage in order to design the best program possible. Q: What is the likelihood that the Centers for Medicare and Medicaid Services at the U.S. Department of Health and Human Services will actually approve the waivers if Utah requests them? A: Based on our discussions with our federal partners, we are encouraged that Utah can get greater flexibility for our Medicaid program. Seema Verma, the Administrator of the Centers for Medicare and Medicaid Services is providing strong leadership. Verma knows, from her experience in the trenches directing Medicaid at the state level in Indiana and from her experience at the highest levels in Washington, that the best way forward for sustainable Medicaid expansion is through flexibility and innovation. Furthermore, others within the administration recognize that with the House of Representatives controlled by Democrats that the Affordable Care Act itself is not going away and that the path to fiscal stability in health care is going to be through innovation at the state level created by granting thoughtful waivers. That is why we are willing to take the calculated risk of creating a bridge program and seeking waivers. Q: Do you support medical marijuana being legalized in Utah? Why or why not? A: Please look to our Issue Tile on Medical Marijuana here.